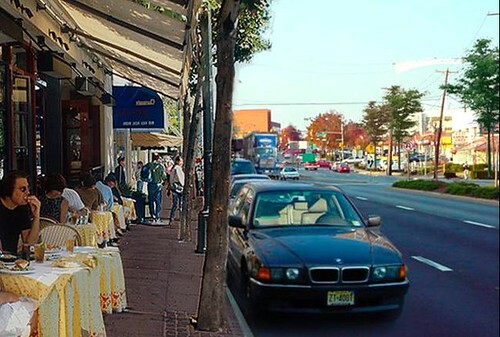 In 2001, Montgomery County brought in representatives from the Mass Transit Administration to conduct a "Visual Preference Survey" about Downtown Wheaton. Created by Anton Nelessen, the survey has been in use since the 1970's as a visioning exercise, determining what kind of places people like or don't like. It's been used throughout the country, most recently in Carroll County in 2006. 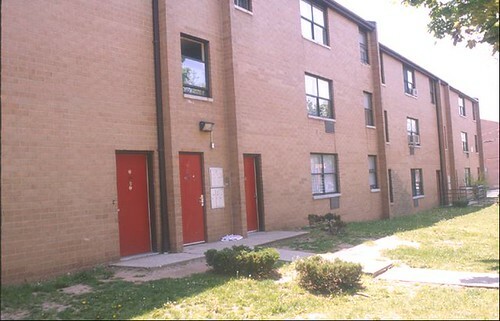 In the survey, a focus group of Wheaton stakeholders were given photographs of places and asked which they liked more. These preferences would later shape the recommendations for Wheaton's redevelopment. The survey asked, "What type of buildings, streets and open space are appropriate for the Wheaton area now and in the future?" Participants were shown over a hundred photographs and asked to rate each one on a scale of -10 (meaning "take it out") to +10 (meaning "keep it in"). Several photos could depict a single idea, like "townhouses" or "landscaped median." Presenting multiple images for the same idea would produce more accurate results. 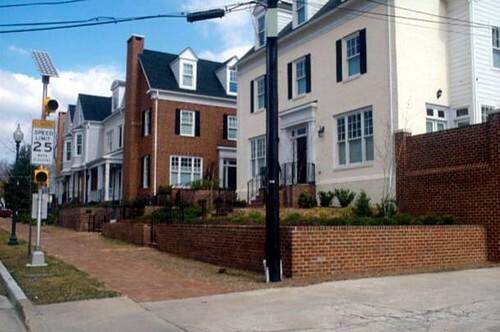 Both of the above photos are labeled "townhouses," but the photo on the left depicting run-down buildings would be rated worse than the one on the right. This allowed participants to state their opinions based on actual conditions, not preconceived notions of what townhouses should look like. - The lowest ratings went to current conditions in Downtown Wheaton: jaywalkers (-7), run-down buildings along Triangle Lane (-7), businesses facing away from the street (-8), messy commercial uses (-8) and the lack of sidewalks along Georgia Avenue (-9). - Among the highest ratings were a proposed amphitheatre (+6), live-work buildings (+6), more parks and plazas (+7), street landscaping (+7) and pedestrian refuges on wide streets (+8). 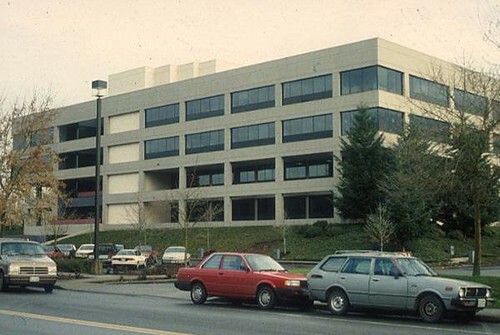 - While surface parking lots received low ratings (-7 and -8), a proposal to turn Parking Lot 13 at Reedie Drive and Triangle Lane into a plaza was coolly received, only getting a +4. - Photos of modernist buildings were rated lower than those of traditional buildings, but newer buildings were preferred to older buildings. 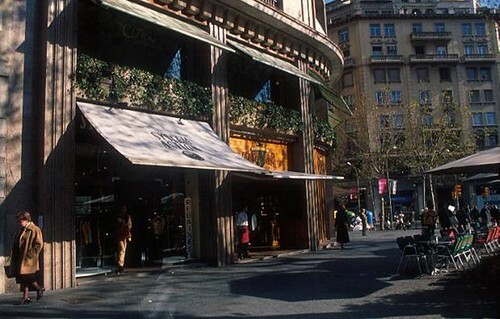 - Retail chains were received poorly. 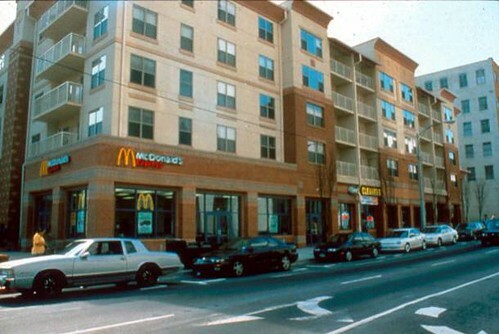 An image of an apartment building with a McDonald's on the first floor received a lower score than one with other stores. 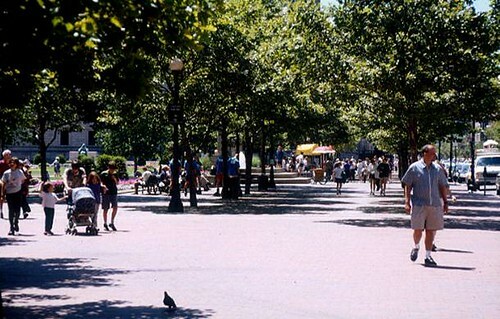 - Photos of empty parks were preferred over photos of parks with people in them, and urban parks with more pavement were rated more poorly than parks with trees and grass. One conclusion that we can draw from the survey is that while stakeholders enjoy Wheaton's diverse population and small businesses, they don't like the way Downtown looks today. But what those improvements should be, and how they can be implemented, are unclear. 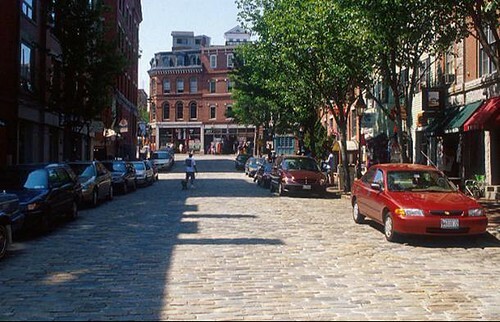 Images depicting what I might call "vacation urbanism" - the cobblestone streets and sidewalk cafes you might see on a trip to Paris - were rated well, suggesting Wheaton residents do like some things about the city. But the things that help make it work, like onstreet parking that buffers sidewalks from car traffic (not to mention can provide close-at-hand parking for disabled patrons) were largely rejected. Photos of two- and three-story buildings received higher ratings (+5) than those of fourteen-story buildings (+2). This is a major issue considering that the Wheaton CBD Sector Plan could raise building heights to 200 feet and a 14-story building has already been proposed at Georgia Avenue and Reedie Drive. Given that most of Downtown consists of low-rise buildings, continuing that development pattern might be very attractive to existing residents. Wheaton's lucky to have an older building stock that makes it affordable for both residents and businesses. 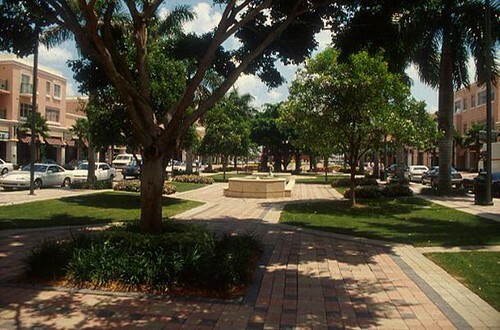 But its spread-out nature encourages driving, contributes to traffic, and has made it hard for reinvestment to occur. Taller buildings and higher-density development could put thousands of new residents and office workers within walking distance of Downtown's amenities. It would help provide foot traffic for local stores, keeping even mom-and-pops in business, and increase transit ridership. But it may erode the sense of "community" that comes from a smaller population. Later this week, we'll look at the recommendations that resulted from this study. In the meantime, check out this slideshow of images from the Wheaton Visual Preference Survey. Dan, I'd love to have you explain what, exactly, was in the survey you described, which would lead anyone to think that stakeholders enjoy the "diverse" population. Perhaps they do enjoy it, but I see nothing in your description of the survey which could possibly warrant such a conclusion. Indeed, the fact that people allegedly much preferred images of parks without people to parks with people, one might tend to take the opposite view, less about the concept of liking or disliking "diversity", and more about preferring open spaces to densely populated ones. I realize that a lot of the results you detail could easily be interpreted as a slap in the face to a lot of the concepts that the Urban Planning Trendies hold dear -- such as a grossly overcrowded urban landscape where everyone is reduced to pedestrianism and parks are just another plaza full of people except this one's got trees -- and perhaps you might take that to heart. Keep in mind that it may also reflect the fact that, given a choice, people tend to live near places that reflect their lifestyle choices. Given that some people do much prefer the crowded and carless uber-urban environment, develop some places that way. People who want that either already live in such places or they'll flock to them if you do build them. Yet some people prefer places like Wheaton to remain much as they are, places that are familiar and on the scale and mode of life that attracted them there in the first place, or to which they became accustomed as they grew up there. Hasn't anyone noticed that all of the plans and "revisions" and "upgrades" of Wheaton have generally had as much success as all of the interations of Rockville Mall? They first tried it in the 1970s, and a bit over 30 years later it mostly works, but think of all the time, money, business failures, and then also think of the many years when shopping in city-center Rockville had all of the attractiveness of immersing one's head in an outhouse. Sure, you can do it, but almost anything else is better. And even what they have there now is an attraction to the wider area mostly because of the theaters; almost all other shoppers are strictly metro-system ridership or the "captive audience" of workers and people doing business at the County buildings. 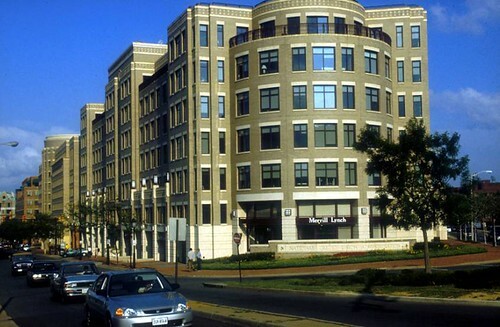 I know the UP Trendies keep going on about "Creating Place in Urban Space", but when you take someplace like Wheaton, it's already a Place, and if you overwhelm it with UP Trendy icons it's just another zipcode and will lose the sense of Place that makes so many people actually want to call it home.